Iron Ore closed a little mixed on Monday yet basis our technical interpretation of the trend, we are quite comfortable with a multi week consolidation phase continuing to evolve here before the next move higher starts to unfold. The are supply disruptions in WA due to cyclone havoc caused by Veronica, yet this has been balanced by weakness in Chinese steel futures. Yet output restrictions on Chinese industrial activity over winter concludes at the end of this week, so an increase in steel output should start to see steel prices increase with this positive seasonality almost upon us. The recent close was [USD] 85.81 a tonne on the benchmark 62% fines, with lower grade ore also dropping. Yet higher grade ore bucked the trend by closing in the green by a small margin. Since the bullish pattern breakout Iron Ore has gone from almost failing technically to the downside, to finally backing our analysis with higher levels still on the horizon. 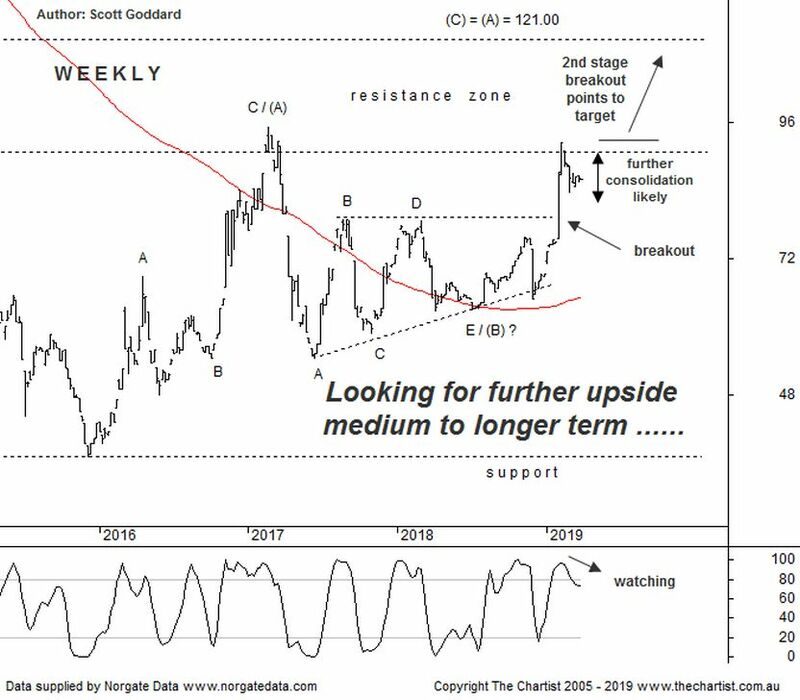 We are continuing with our longer term prognosis on the metal which remains fixated on the larger (A)-(B)-(C) equality move eventually tagging 121.00. Potentially even before the year is out. Right hear and now though with price overbought on the weeklies, we continue to see this consolidation phase as healthy. So long as it remains shallow, then our view is that the next significant move is going to be higher rather than lower. Ideally this consolidation phase takes quite a few more weeks before it completes. Especially as a more immediate swing higher from here could bring to the table some Type-A bearish divergence. On the flip side further sideways with an element of weakness attached to it over a number weeks, will have the potential to take our divergence indicator back to oversold. This will then be a solid platform for the next move higher to evolve from. For now price action continues to support our bullish analysis so that's all we need to know. BHP, RIO and FMG are the stocks we constantly recommend to check in on when Iron prices start moving higher. The breakout at the beginning of February saw all three start to accelerate to the upside which shows their correlation to the Iron Ore chart that we regularly review on these page. FMG's strong leverage to Iron Ore prices has witnessed it as being the star performer. If you missed this recent move north in these ASX listed stocks, a second chance opportunity may well be forthcoming once this immediate consolidation phase finally draws to a close. Put all three on your watch lists.